AIA | Founding Partner AJ, a University of Detroit Mercy graduate with a Masters of Architecture Degree, is an award-winning architect with fifteen years of design and project-management experience. His portfolio includes single and multi-family housing, large-scale commercial and academic facilities, masterplanning and everything in between. His professional philosophy is that great architecture produces simple, functional solutions for complex human needs, and always depends on a close collaboration between the client and design team. Registered Architect | Founding Partner Having over thirty years experience in the profession, Michael has gained firsthand knowledge of all phases of the building process, from site selection through construction administration and for a wide range of project types. Michael has a passion for design and his ability to synthesize client’s objectives into architecture is evident in his intelligent design solutions. Michael earned a Bachelor of Architecture Degree from the Boston Architectural College where concurrent professional employment and academic coursework create a more complete, holistic education. noun oom-bra \ üm -brə \ A small, creative firm of design professionals, focused on creating thoughtful and unique environments using skills forged through past experiences and built on meaningful and lasting human relationships. FIRM PROFILE Through their diverse range of expertise, OOMBRA creates thoughtful spaces and memorable places, meant to evoke a conversation, an emotion and an experience. OOMBRA takes a client’s objectives and communicates them through compelling designs. They believe successful architecture and placemaking is realized when the complexity of the problem is simplified through the design process, resulting in a clear expression of purpose, material, light, shadow and form. Through all of their work, OOMBRA strives to create a strong sense of community and a built world that enhances the human experience. AJ Reilly | AIA | Founding Partner AJ, a University of Detroit Mercy graduate with a Master of Architecture Degree, is an award-winning architect with fifteen years of design and project-management experience. His portfolio includes single and multi-family housing, large-scale commercial and academic facilities, masterplanning and everything in between. His professional philosophy is that great architecture produces simple, functional solutions for complex human needs, and always depends on a close collaboration between the client and design team. Michael Brahler | Registered Architect | Founding Partner Having over thirty years experience in the profession, Michael has gained firsthand knowledge of all phases of the building process, from site selection through construction administration and for a wide range of project types. Michael has a passion for design and an ability to synthesize client’s objectives into great architecture. Michael earned a Bachelor of Architecture Degree from the Boston Architectural College where concurrent professional employment and academic coursework create a more complete, holistic education. 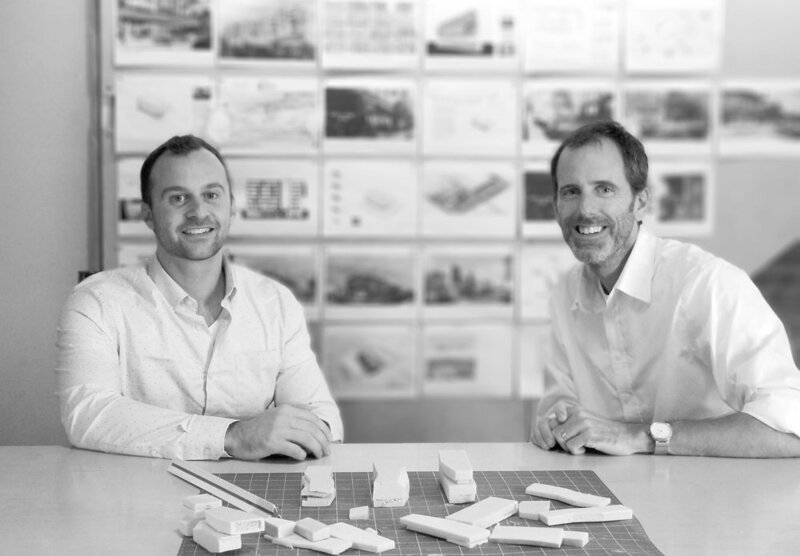 EXPERIENCE With more than one-hundred projects in their professional portfolios, Partners AJ Reilly and Michael Brahler bring to OOMBRA firsthand knowledge of all phases of the design and building process, from site selection to construction administration, on a wide range of award-winning projects. Projects by proportion shown below. PROCESS OOMBRA’s design process always begins with a conversation to define the project parameters and goals, but more importantly to understand what drives and motivates a client to engage them and embark on their journey. This conversation continues throughout their design and construction process and helps them to deliver rich and responsive project outcomes. They do this by analyzing the existing site context, the historical context and the surrounding environment against the programmatic needs of the project to inform a set of ideas that begin to form the design concepts. These values provide a strong foundation for every project no matter the size, location or use and help to work within the constraints of their client’s expectations, budget and schedule. As visual creatures they use a variety of tools (drawing, modeling, building) to help connect the team to the design process in a way that is clear and concise, allowing for a truly integrated and collaborative approach. They explore and test multiple space and planning scenarios to realize the full potential of the project, giving their client the ability to participate from the project conception to completion. Along with the client, they work closely with the design team, builder and community, investigating problems and concerns to find a shared vision, which is reflected on throughout the duration of the project. They accomplish this by asking the right questions and bringing together like minded individuals, using collective strengths and knowledge to achieve common goals. When possible, they engage with a builder early in the design process, keeping open lines of communication and collaborating on best possible solutions when issues arise later on in the field. Collaboration is paramount to every successful project in their office and ensures their client’s needs are met and executed at the highest level, delivering the long-term project goals and lasting relationships.